On Thursday I posted a new prayer for the safety of soldiers serving in the IDF. 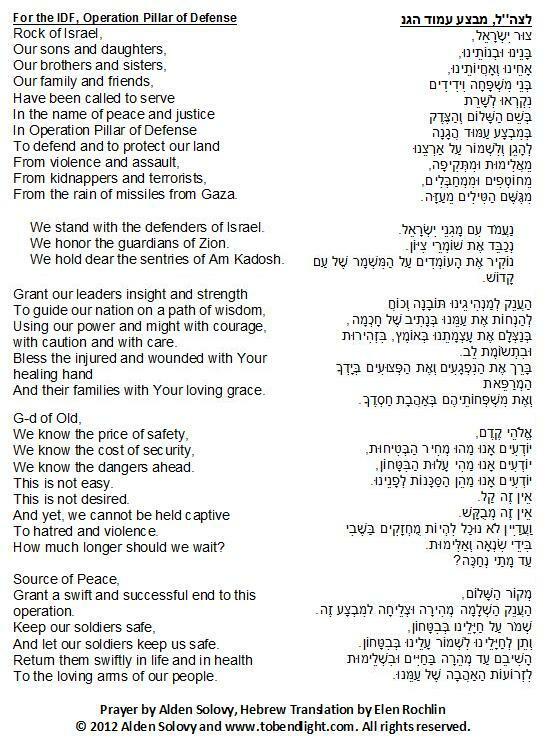 Since then, I’ve received several requests for a Hebrew version of this prayer. Here it is. As I wrote in the original post, most of it is new, although I’ve taken the three lines from “Gilad, Home at Last” and a paragraph from “In Times of War.” This prayer can also used as part of a three-prayer liturgy. The second is for terrorists to find a new path called “To the Terrorist.” The third is for peace, called “For Peace in the Middle East.” RJ Blog posted the entire three-part liturgy. Earlier today I posted another new prayer called “Lone Soldier, Operation Pillar of Defense.” It’s a prayer for Lone Soldiers and all soldiers of the IDF. Postscript: Here are links to “To the Terrorist” and “For Peace in the Middle East,” as well as a link to more prayers for Israel. 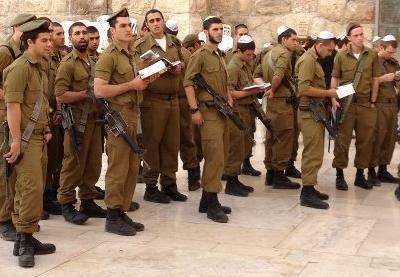 I took the photo of the soldiers at the Kotel on Monday.